When life gives you lemons, make marmalade. These hints are for you if there’s too much week and not enough money. To make up the shortfall of what you have versus what you need, try a little imagination and creativity. 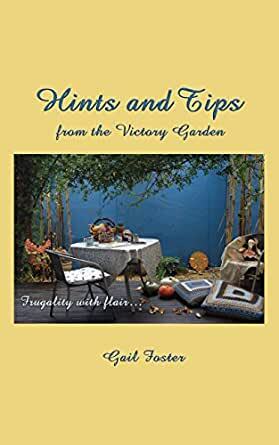 Hints and Tips from The Victory Garden illustrate skills and tools that answer the question, ‘What can I do?’ There is always something we can do. Need a wall hanger? Try a toast rack from the tip shop. Turn an old barbecue into a water saver garden sink, a 10kg onion bag is perfect for a compost tea bag. Recycle sheets and towels for further domestic use. Keep cuddling that old favourite jumper as a water bottle cover. Learn how the frugal life can be easy, fun and safe. A yearning to give to family, friends and community combined with a small income results in unique gifts. A garden, the natural world, the tip shop, offers a cornucopia of creativity. Home-made preserves, potpourri and artistically packaged biscuits, a bunch of flowers or potted plant, chicken soup for an ailing friend, gift cards and carry bags, make satisfying work and need little money. The process, however, may be seriously addictive!